Do You Have Trouble Asking For What You Want? I don’t mean simple things like “pass the gravy” or asking somebody to do their job at work. I’m referring to asking the people closest to you to do something for you. As you may know, I’ve written two books dealing with affirmations and I use them daily. Positive affirmations were a great tool in helping me move from depression to joy; in transforming myself from someone who thought life sucked to someone who loves life. There is one particular affirmation that I write down and say out loud daily – often multiple times each day. 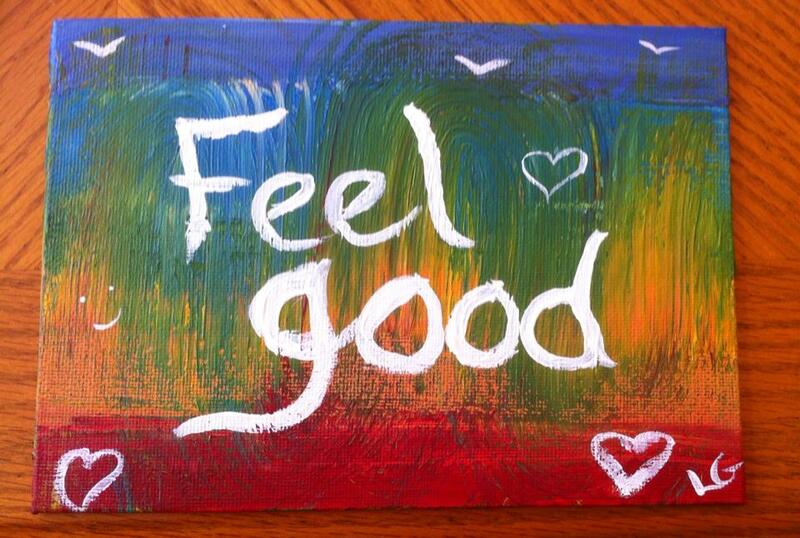 That affirmations is: The most important thing today is that I feel good. I got this from Abraham Hicks and added it to my daily practices when I was really struggling with suicidal thoughts a few years ago. I wanted, no, I NEEDED to remind myself that I had the power to choose to feel good, to choose what I wanted to focus on. Last week after a few gloomy mornings (internally and externally) I was writing, “The most important thing today is that I feel good,” but not feeling it. I thought I need a sign, not an earth-shattering Sign From God (though I’d welcome that), but an image so I can see this message of feeling good too. I decided to ask my wife – who has recently been enjoying painting – to make me something. Wow – I honestly never thought I did. But in that moment I realized that for years I wouldn’t ask for help, not thinking I was worthy of it, but even now – to ask my wife to create something for me… resistance is an amazing thing. It only took my a second to feel it and push through, but how often have I hit that resistance, felt some emotion – probably a level of fear – and decided not to ask? Countless times. How about you? If this resonates with you, find a way to practice asking for what you want. Don’t concern yourself with the response, just practice asking. Leave a comment for: "The Power and Fear of Asking"